How to disable the weekend dates in the DatePicker control? You can disable the weekend dates by using the BeforeDateCreate event of the DatePicker control. In this event, you can get each date, args.date, and its corresponding element, args.element, in the event argument. In that element, add the class e-disable to the weekend dates as shown in the following code example. 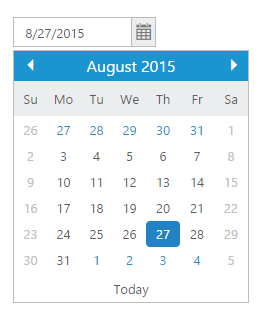 The following screenshot displays the disabled weekend dates in the DatePicker control.